Angelico Press, which has earned a reputation as one of the finest Catholic publishers today for its wide selection of books on traditional Catholic doctrine and worship, has just released two books that will be of great interest to NLM readers: a revised and expanded edition of the (hitherto out of print) classic by Martin Mosebach, The Heresy of Formlessness, and the English translation of a fine “primer” on the sacraments, No Trifling Matter: Taking the Sacraments Seriously Again (Italian original: Con i sacramenti non si scherza) by Msgr. Nicola Bux, a professor of sacramental theology and a close collaborator of Joseph Ratzinger/Pope Benedict XVI. English readers looking for a description of the content and endorsements of Bux and Mosebach will find them at the links above. Here, with the permission of the author and publisher, we reproduce the Foreword by Christopher J. Malloy of the University of Dallas, who blogs at theologicalflint.com. An Italian priest and liturgical theologian, Msgr. 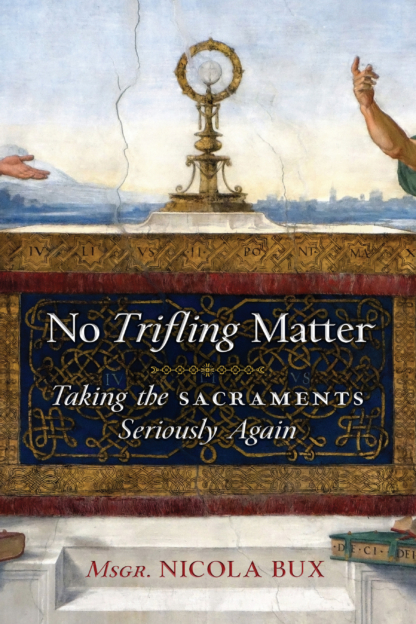 Nicola Bux, has written a book on the sacraments quite popular in Italy, now available in English translation. This remarkable book is chock full of pithy insights, noble exhortations, and keen criticisms. Its unifying theme, the perennial sacramentality of the Church in the context of contemporary obstacles and difficulties, allows its scope to be quite vast and sprawling. No Trifling Matter is not intended as a textbook. Rather, its sundry edifying observations and notes of wisdom make for good reading in small portions. There is much food for thought here. The anonymous translator offers notes with helpful theological clarifications and background insight on Italian culture. Fr. Bux presents a thoroughly Catholic view, touching on East and West, the spiritual and the physical, the Ancient and the New, the natural and the supernatural, sin and grace, predestination and free will, Church and world. Among the dominant sub-themes is the sacred and the profane. “Sacred” means holy, dedicated to God. “Profane” has several meanings. It first signifies what lies “before” or “outside” the temple. It also signifies what is natural, not yet consecrated. Finally, it can signify what is crass, tasteless, or even opposed to God. As Bux reminds the reader, what is earthly and ordinary, but not crass, is called to be taken up and ordered to God. The Church is called to consecrate the world to God. This beautiful vision has been effaced from the Catholic imagination in the wake of an errant theology that obscures the distinction between sacred and profane. Under a semblance of mysticism, some (e.g., Karl Rahner, Vorgrimler, Martos) claim in various ways that the world is already sacred from the beginning. They mock a caricature of the Tradition, as though the Tradition denied that any grace exists outside of church buildings. The Tradition, including official Church doctrine, never made such a ridiculous claim. The Church teaches (a) that there are graces outside of her visible boundaries and action, (b) that such grace objectively leads back to the Catholic Church, (c) that there is no salvation outside the Catholic Church, and (d) that only those who are invincibly ignorant of this truth are not condemned for not entering the Church (while even these are deprived of many helps). In short, the Tradition has by no means a simpleton’s position. In fact, the Real Symbol notion falls short of Catholic dogma. The revolutionaries are more straightforward when they describe their notion as a “Copernican revolution” in sacramental thinking. As they say, the Tradition (dogma) holds that sacraments are causes of grace, that sacraments convey grace otherwise not present. They reject this teaching. For them, the grace is already there but is in the sacramental act given the correct linguistic and gestural expression. Further, the revolutionaries have lost the sense of the supernatural and of sin and the need for repentance and sacramental grace to escape eternal damnation. If not many people are unfortunate enough to read this ruinous line of thought, many suffer in parishes because of its influence. For those looking for a thoughtful antidote, Bux’s book is a fine option. Bux recognizes the importance and necessity of catechesis, but he urges us to appreciate the noble work of the sacraments and not to let explanations dominate rationalistically. With the assistance of words, we should live and contemplate the signs, which point to and convey what is higher and deeper. To appreciate signs, Bux reminds us, is a basic human task. All of being is significant. Hand-in-hand with the loss of the sacred goes loss of the sense of God, as Bux notes with Ratzinger. Many current celebrations of Mass fail to draw the mind to God. They fail to encourage us to lay aside earthly cares and attend to the heavenly banquet. His transcendent aim obscured, man becomes the center of attention. Although Vatican II did not ask for it, the tabernacle is often banished to the outskirts, making the Blessed Sacrament “homeless.” The liturgy then becomes a field of human entertainment, not entry into the divine work. In addition to this macroscopic view of things, Bux also hones in on particular, pressing issues. He points out, for instance, that Vatican II did not cast Latin into a dungeon. Sadly, Latin languishes despite having many reasons to be retained. In a globalized world, Latin offers an unexpected promise of unity not yoked to any current political regime. More importantly, Latin is a spiritual treasure of the Church, part of the living Tradition of handing on the faith. A simple return to Latin is not enough, however. Even the Latin of the Ordinary Form of the Mass, Bux notes, mutes expression of such elements of the faith as the existence of the devil, the darkness of sin, etc. The Ordinary Form of baptism retains no exorcisms, only prayers of liberation. This privation is a mark of discontinuity. Bux also recalls the centrality of sacrifice in the Mass. Although also a banquet at the table of nourishment, the Mass is firstly a sacrifice of the altar, a sacrifice of right worship to God effective as propitiation for sins. We need to retain both aspects. Attention to the Real Presence also makes clear that the Mass is a divine work. The Eucharistic presence of Christ does not evolve gradually through the work of human hands but is achieved instantaneously by the power of Christ in heaven, working through the hierarchical priest on earth. How appropriate to ring the bells at this solemn moment! In order to be fit to receive the Eucharist, one must be in the state of grace. Among today’s great errors is flight from the Gospel’s exhortation, echoed at the Council, to become holy. Not everyone may receive the Eucharist, for not everyone is in the state of grace. Many people today have left a marriage and attempted to become “remarried,” without having received an official judgment from the Church that the first marriage was from its inception null. Those who have done this and are engaged in sexual relations are in a state of sin and may not receive the Eucharist. They must repent, which requires firm purpose of amendment, and receive absolution in Confession. Only false mercy would attempt to override or reinterpret these life-giving elements of divine law. Today’s loss of the sense of sin goes hand-in-hand with the false notion that the world is already holy. Common sense tells us this notion is false. If it is holy, why are so many so spiritually sad, so misled, so confused, so distraught? Missionaries, who don’t just think about loving others but do something about it, first exorcise new territories and then they lay their foundations. Similarly, church buildings are solemnly consecrated, set aside solely for divine use. The profane is not the sacred, although what had been profane can be consecrated and brought into the sacred. Alas, Bux cries, nowadays churches are treated as venues for mundane, even shameful events. How can the mind’s eye rise to God when the house of the holy is just another theater? Perhaps most timely is Bux’s chapter on marriage. He nicely treats the differing theologies of the minister of marriage in East and West. He stresses the centrality of fecundity and the complementarity of male and female in the sacrament. As Bux relates, the homosexual ideology of its essence violates sexual difference, all the while pleading in legal contexts recognition of “difference.” The argument is disingenuous because it (a) abolishes truth by demanding acceptance of error and (b) abolishes the loveliest of differences, male and female. Although respect is due to everyone as persons, human “rights” require reference to human nature and hence to God’s law. This book would make a fine gift for a priest who has an open mind to a call to return to the beauty and truth of Tradition. It might be seen as a bridge, inviting one to contemplate the disorders of today’s liturgical experiences as reason to reconsider the timeless wisdom of the Church. Practicing lay Catholics without theological training will also enjoy it. May it be widely read! The Angelico page for this book is here; the Amazon.com page is here.